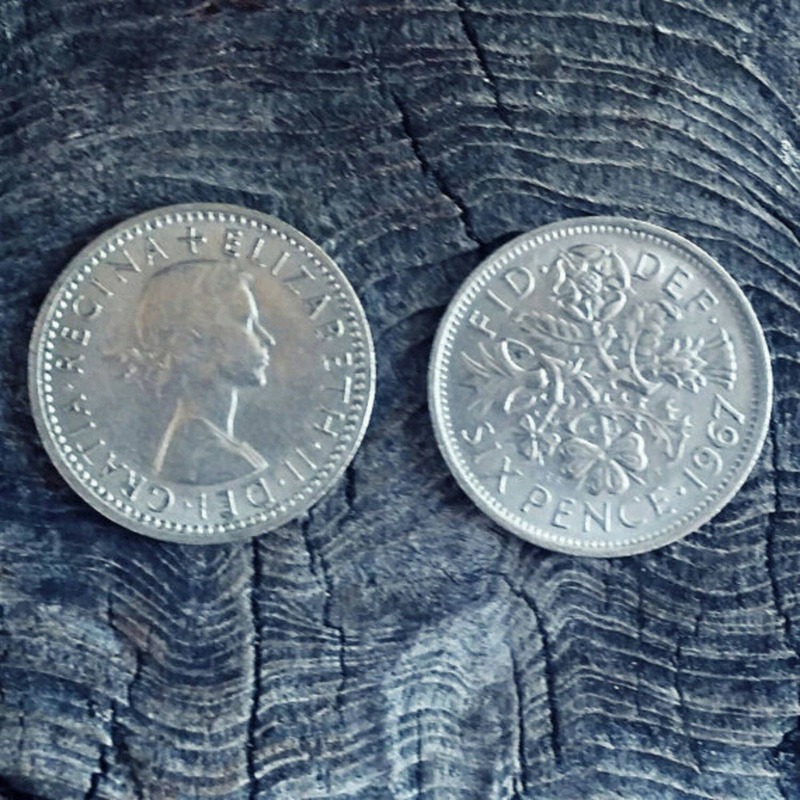 In England, we have used the *silver sixpence for many things, least of which, witchcraft! It is often used as a Faery offering and for scrying. 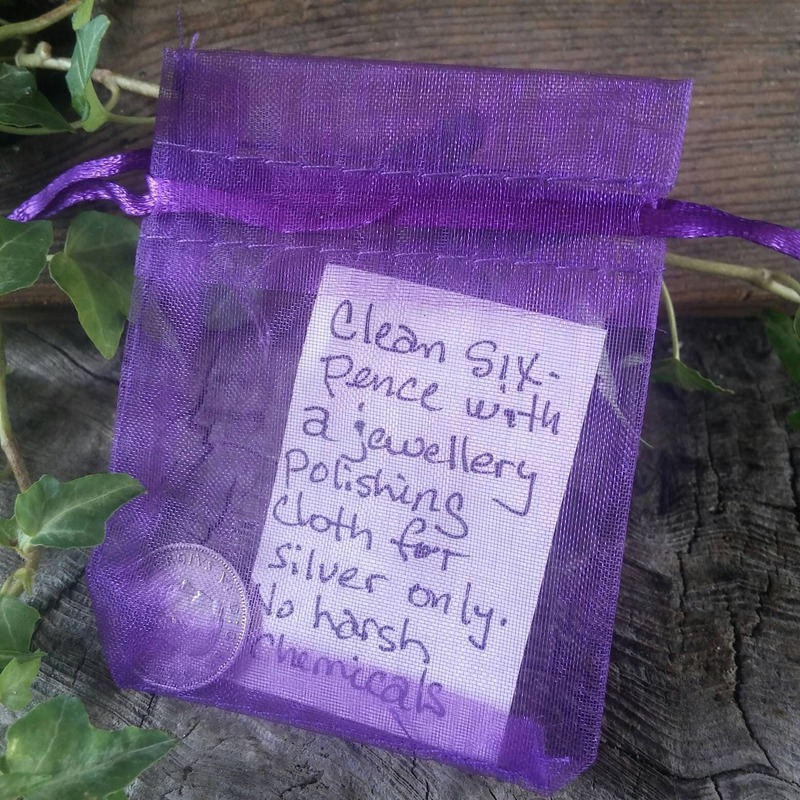 Of course, the lucky sixpence has loads of other uses, not necessarily witchy. 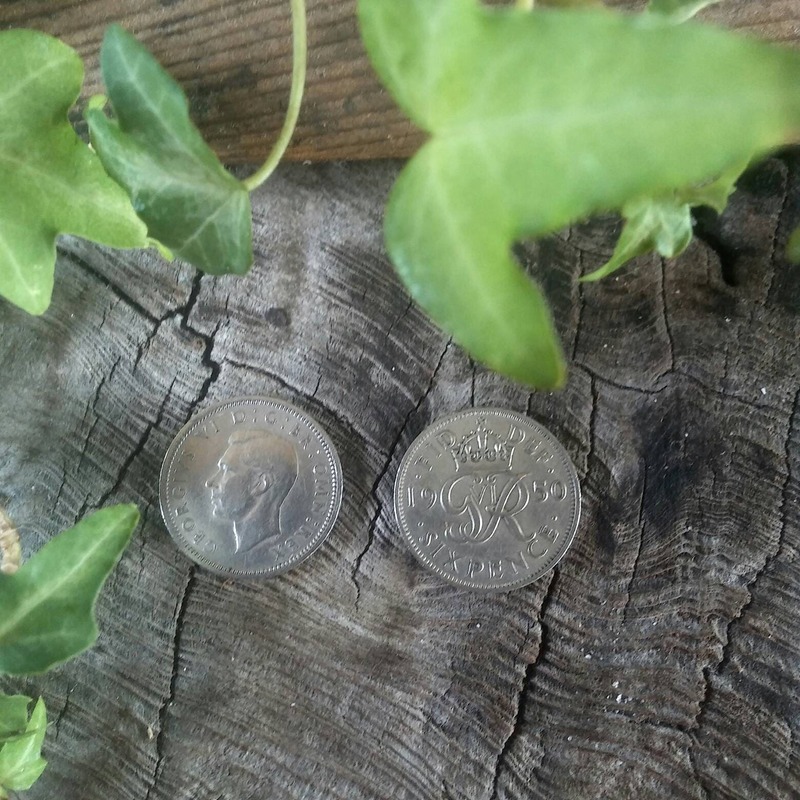 We always had a sixpence in our Christmas pudding for wealth in the coming months. My grandmother told me if a witch gives you a sixpence you will always be looked after and protected. And a sixpence for your shoe." Then, the bride would tuck the lucky silver sixpence into her shoe and she was ready for her wedding as she knew her lucky sixpence would bring financial luck to her married life. It is the coin with which to pay the Fae or to give to them as an offering. It is also the coin that was used for many years to place on the eyelids of the deceased for them to pay Charon the ferryman for passage across the river Styx to the gates of the Underworld. Silver sixpences are also used for scrying. The black cauldron is filled with water and the sixpence dropped in to it to reflect the Moonlight. Another use for the sixpence is to find out who might be ill-wishing you. Take running water over which both the living and dead travel and put it into a dish with the sixpence. The person that is ill-wishing you will appear in the dish. Use drops of this water, once the identity has been estblished, to sprinkle on the ill-wished person, animal, crop or home and it will break the spell and return it to the sender. If you have a silver polishing cloth, you can keep your sixpence shiny and new looking! Please visit our Amulets section http://etsy.me/203WTEg for more selection. PLEASE NOTE: Although we believe all of our magical items work as intended, we are required by law to state they are sold as curios only. We provide the tools, you must provide your own magic. You must be 18 and older to purchase from us. We happily accept Paypal and Etsy Direct check-out [credit card],and Etsy gift cards for shop purchases. We expect payment at the time of sale. We DO NOT accept cheques/checks/money orders. We post parcels within 3 business days. This does NOT include weekends, therefore, if you purchase an item on a Friday, we have 5 days (2 weekend days plus 3 business days) to post your order. Please rest assured that we make every effort to dispatch orders on the same day of purchase, if possible. We post orders via First Class post which can take 2 to 7 in US and up to 14-20 business days elsewhere to reach their destination, depending upon where you live. Read further if you need your order sooner. We ship via Standard First Class US Post. If you require your order to reach you sooner than 2 to 7 business days, please send us a convo for a Priority or Express Mail quote. All parcels have tracking, and the number will be in your dispatch confirmation email, which is sent to your email inbox with which you used to sign up with Etsy and NOT your Etsy convo inbox. If you require the parcel to be sent with signature confirmation, please tell us before ordering so we can attach the proper amount to postage. We do not insure parcels unless asked. Convo us if you wish to have your item(s) insured before ordering so again, we can attach the proper amount to postage. We ship First Class International. If you require your order to reach you sooner or if your order is very large, convo us for a price quote for Priority Mail International or Express Mail International. Many times, on large or heavy orders, it is less expensive to use Priority Mail International. Your parcel will have tracking included and will be given you in your dispatch confirmation email, sent to your email inbox as soon as we post. All orders: We send a shipment notification as soon as your order is posted at the Post Office. With the variety of shapes, sizes, and weights of our items, it's difficult to give an accurate automatic shipping prices when you order. We charge a nominal amount over the postage rate on US orders to include packaging materials. If you are charged $1 or more over the amount of actual postage & packaging (P&P), we shall refund the overage back to you. Attention international customers! Any customs or duties fees that your post office will collect are your responsibility. Whilst it is not illegal to send essential oils to other countries, we cannot ship essential oils by UPS Air deliveries. All essential oils must ship UPS Ground. The U.S. Department of Transportation (DOT) prohibits air shipment by Air or Vessel of items that are flammable or combustible unless they are properly processed as hazardous materials. We do not offer hazardous material processing services. We must state this as our essential oils/potions are all sent out from the U.S. Please be advised that P&P may be slightly more expensive for essential oils/potions and may take a little while longer to arrive. However, we will only ship legally and safely as we're honour bound to do. **Need your order sooner? Contact us via Etsy convo and let us know when you must receive your order. We can set up priority or overnight post PRIOR to you paying for your order. We will let you know before you actually make your purchase what your shipping cost will be. And please do not ask us to "promise" your order will be with you on the date you expect it. There are too many variables in the postal systems we use to promise anything. USPS Priority Express Overnight can take anywhere from one to three days. But we DO promise to do our very best. If you are ordering items which total more than the 50.00 free insurance given by US Priority Mail, we include the price of extra insurance in the shipping amount. We ship within the US by Flat Rate Priority Mail on expensive orders so that your items are insured. This is all calculated ahead of time and shows up in your total bill at check-out. We add no extras to the cost of the shipping. If you are happy to pay less for shipping and not have insurance, please be advised you must let us know before ordering so we can change the shipping amount AND if your parcel arrives damaged and/or the items are damaged we will NOT be held responsible for the damage. If you have opted out of insurance then you needn't come to us for help. This is not the case on less expensive items which we ship by First Class Post. We will try to work with you for a happy outcome. Of course, if you wish for us to add insurance for less expensive items, we will be happy to do so prior to your purchase. Just convo us. We want you to be 100% pleased with your purchase, your satisfaction is very important to us! If you're not happy with an item, please contact us within 5 days of receipt of your item with specific details, which may include photos, of why you are not happy with the item and we'll work with you to determine whether the item should be replaced to your satisfaction, repaired, or money refunded. Do not expect a replacement if your item breaks after several months of use. We DO NOT offer a one-year warranty! We package items as carefully as possible for shipping, but in the event an item is damaged during shipment, it is only automatically insured under Priority Mail as we do not take out insurance on Standard/First Class Post. If you wish for your package to be insured, please convo us for a price for insurance to your destination. And do please convo us about your problem first. Please do not give a bad review without giving us every chance to make your order right, because we WILL make your order right. If you should feel the need to put up a nasty review just because you can, and you've not given us a chance to fix the problem, we shall consider the sale to stand as final and not offer a solution. NOTICE: Essential oils/potions cannot be returned. Personalised and bespoke items cannot be returned. Earrings cannot be returned. We do not accept cancellations. We are happy to change the item for a different one, or give a voucher for the amount spent on order you may use it at a different time for a different item. You will still be accountable for postage/shipping. Every item found here is handcrafted by Isabella, Alexis, or Rhiannon unless otherwise stated in the description. 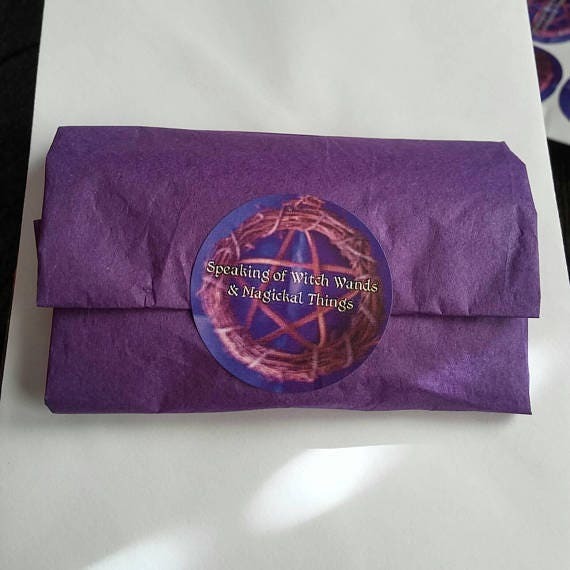 Alexis does accept enquiries for custom art, runes sets, talismans/amulets, and crochet work; Rhiannon will take bespoke wand orders, and Isabella is always happy to create a bespoke wand, runes set, talisman/amulet, or jewellery item, or whatever takes your fancy, just for you and the purpose it is intended for. We keep our per item charge very small for light items, so you really don't need to ask us to combine items for a lower shipping price. You must bear in mind that if we find we've overcharged you by 1.00 or more we always refund the overcharge. In many cases, particularly for international orders, we actually end up not charging enough but we would never think of asking the customer to pay for our mistake. Our heavier items are charged by calculated weight to your country or your US zip code, therefore you should be charged exactly what it costs to ship and if you asked us to "combine an order for shipping" we would only come to to the same conclusion. We are always happy to change a charm on a pendulum or anything else we can reasonably do to make your purchase more tailored to you. Just send us a convo about the item and what you would like. If we have what you want, we're more than happy to make the necessary changes. Bespoke orders: We are always happy to accept bespoke orders. Tell us what you are looking for and we'll make it happen,,provided we have the wood you prefer for a wand or smudge fan, etc, that you're requesting. We shall keep you informed every step of the way with photographs of your item, pricing for special crystals or other adornments so that you can approve or disapprove each thing we do. When it is ready, we shall send the final photo for your approval, list your bespoke/special order in your name, send you the link and the once you have paid, we'll post it the same day if at all possible or by the following morning. It is our solemn promise to keep you completely informed and happy with what we create for you. We do not send newsletters via email nor any sales solicitation, therefore we never collect customer's email addresses for our own use or the use of any other party. To fulfil your order, you must provide us with certain information (which you authorised Etsy to provide to me), such as your name, email address, postal address, payment information, and the details of the product that you’re ordering. You may also choose to provide us with additional personal information (for a custom order of a wand, for example), if you contact me directly. Business transfers. If we sell or merge our business, I may disclose your information as part of that transaction, only to the extent permitted by law. Access. You may have the right to access and receive a copy of the personal information I hold about you by contacting us using the contact information below. Object. You can object to (i) our processing of some of your information based on our legitimate interests and (ii) receiving marketing messages from us after providing your express consent to receive them. In such cases, I will delete your personal information unless I have compelling and legitimate grounds to continue using that information or if it is needed for legal reasons. We do not offer gift wrapping and packaging on the whole, however, we are happy to do a special gift wrapping service for those who contact us prior to ordering. There will be a small fee involved, therefore, if you wish for us to gift wrap your order, please let us know and we shall make as special order, including gift wrapping, just for you! We are always happy to create special items for our customers! If you want a custom carved wand or smudge fan handle, please contact us 2 months prior to the event such as a birthday if you're ordering for that purpose. Bespoke wands can take up to 2 months to create, depending upon your request. Personalisation, at this time, is only available on wooden items by pyrography. When you are happy we shall place a special listing in our shop for you to purchase your item. All essential oils/potions are created in the US and may only be sent via ground delivery because essential oils are flammable. For this reason, we can't post to other countries. NOTICE: Essential oils/potions can NOT be returned. We only offer First Class post, however, if should need an item more quickly, please convo me for quotes on Priority, Priority International, Express, and Express International. Get your quote before purchasing and we can change the listing to include your special postage amount. We do not not combine shipping as there isn't a need for it as you might need on eBay. Etsy takes care of the combining of items just as any online shop does. We set our small per item fee to make up the difference in the increased heaviness of a parcel when a customer orders several items. This saves us time by not having to re-figure postage for larger orders. Then, Etsy does the rest by totting it all up and you have your postage fee!